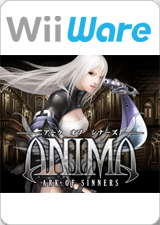 ANIMA: Ark of Sinners: While fleeing from theirs pursuers, Celia and Nemo fall into the depths of the earth to that place. All alone, she awakens in an unknown location for her, an empty metropolis inhabited only by shadows. The graph below charts the compatibility with ANIMA: Ark of Sinners since Dolphin's 2.0 release, listing revisions only where a compatibility change occurred. This page was last edited on 2 March 2017, at 10:42.